Doors have always been an important aspect of architectural design. Besides functioning as passageways between spaces, they serve as an important mode of expression. There is not much of a ‘facade’ that one gets to design in a tight settlement such as Dharavi Koliwada and with their design, colour, material and textures, doors often supply enough character to transform elevations. Whilst some are simple and purely functional, the others are heavily ornamented statement pieces. 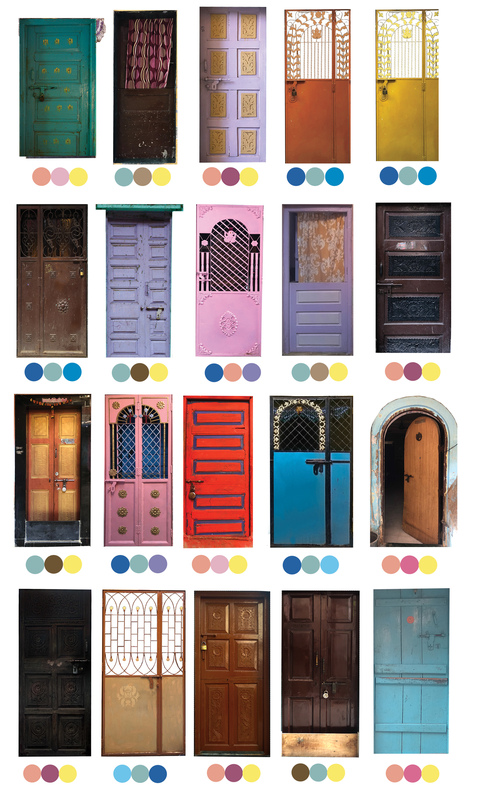 As a part of a study to inspect and analyse the essential elements that constitute Dharavi Koliwada’s architectural language, we have categorised commonly found residential doors in the village, into seven major categories on the basis of their opening, material, and finish. The categories are namely: the classic block-wood door, single shutter panelled wood door, single shutter carved wood door, double shutter panelled wood door, half shutter panelled wood door, hinged double shutter metal door, and single shutter metal door. The metal door is an added layer of security in front of the wooden main door and is stylised to complement it. It does not commonly occur and is usually found in the more affluent households. A lot of houses that forgo a metal door use foot-high wooden dividers to prevent rodents from entering their houses. The half shutter panelled wood door has evolved from this very concept. It creates a physical barrier while still maintaining visual connectivity. But these doors are not just entities of material and function, they tell a story about the evolution of the settlement and the changes happening in families. For example, each panelled door is a design response to the increasing price of timber. More panel's get added on as it gets more unaffordable to have larger timber doors. As a settlement comprising mainly of Koli families began being populated by migrants, it became harder to continue the 'always open door' traditions. The metal doors, with semi open grills and jali's are responses to this changing fabric of the koliwada. Following the story of these doors, windows, or even grills is almost a way of chronicling the story of the settlement and its residents. While tracing each door’s evolution is a bit tricky as most of them are results of mass-produced processes, one can still see evidence of a certain kind of design progression that has emerged from this Koliwada, giving birth to a subconscious visual language even as new things are built every day. The exhibition Koliwada Charcha is an attempt at understanding the essence of Dharavi Koliwada's architectural and visual language.